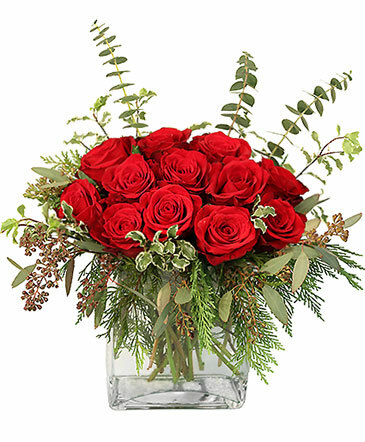 This contemporary beauty features red and white roses, lime green carnations and assorted Christmas greens, hand-crafted by our expert florists with berries and realistic pinecones. At the center is a clear glass cube vase with a tea light candle inside, perfect for casting a cozy glow on the holiday festivities. 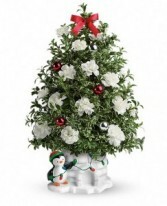 •Beautiful red and white tulips look radiant amongst Christmas greens of Douglas fir and white pine. 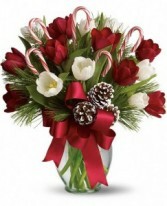 •Decorated with candy canes, frosted pinecones and red satin ribbon, and presented in a graceful clear glass vase. 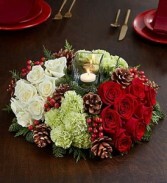 •Approximately 14" W x 15 1/2" H •This item is hand-arranged.